What is an Unverified Post? Has an unverified post appeared on your calendar? Here's what happened and how to stop it from happening moving forward. An unverified post happens when the posting process is stopped partway. 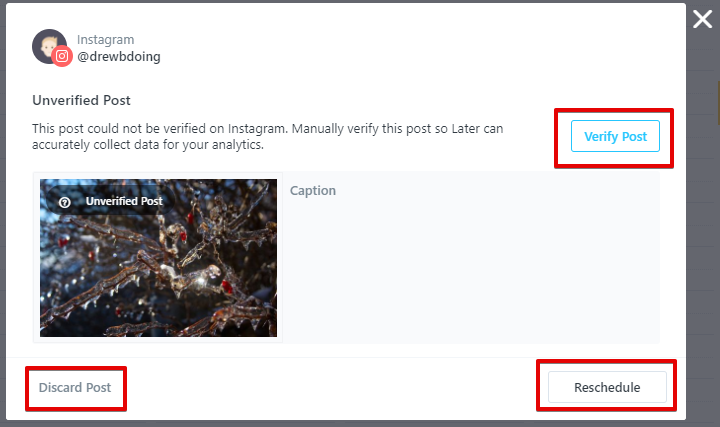 The most common way to create an unverified post is to interrupt the posting process after going from Later to Instagram. These happen because Later does our best to make sure that our posts are successful -- so we look for the post a few minutes after it's been posted, to make sure it worked. If we can't find it automatically, we flag the post on your calendar as "unverified", and give you the chance to match it to the correct post! Make sure you have the correct Instagram account selected in your Instagram app before hitting "Open in Instagram"
Switch to Auto Publishing to avoid this entirely! There are three actions that you can take with an unverified post: Verify, Discard, or Reschedule. When you click this button, you'll be brought to your Instagram feed, where you can match the scheduled post with one on Instagram! This is best used when you've posted the post, but we weren't able to automatically match it; sometimes, heavily editing the photo can foil our attempts to match it automatically! If you missed your post, or if you had to stop temporarily, you can reschedule your post automatically! Click this button and you'll be taken back to the Create Post window, ready to set the new time and date. If this isn't a post you want to keep, simply hit Discard Post, and you'll be able to remove it from your calendar!